These guidelines cover the hazardous nature of laboratories and laboratory work and direct the reader to a wide range of information available on laboratory safety. Due to the diverse nature of laboratory work, not all specific and detailed safety information is provided in this manual. Instead reference should be made to local or departmental laboratory safety manuals and standards operating procedures (SOPs) that should be developed and made available in each laboratory area to cover the wide range of risks posed by local laboratory operations and practices. A reference list of relevant Standards, Codes of Practice, Guidance Notes and legislative documents is provided to assist staff to achieve laboratory safety compliance and management of risks associated with laboratory work, to ensure the health, safety and well-being of all personnel working in or accessing laboratories. Only authorized persons should be allowed to enter the laboratory premises. Faculty, staff or students who wish to have access to the laboratory facility and equipment must secure the necessary forms before starting any laboratory work. All users are required to log in entry into the research facility, and the use of instruments/equipment. Laboratory doors should be kept closed always. Laboratory coats, uniforms or scrub suits must be worn at all times for work in the laboratory. Wear specific Perosnal Protection Equipment (PPE) when appropriate especially in Biosafety Level 2 areas. Gloves, isolation gowns, and foot cover must not be worn outside the laboratory. Safety glasses, face shields or other protective devices must be worn when it is necessary to protect the eyes and face from splashes, impacting objects and sources of artificial ultraviolet radiation. Open-toed footwear must not be worn in all laboratory areas. Long hair must be tied back. Eating, drinking, smoking, handling contact lenses, applying cosmetics, and storing food for human consumption are strictly prohibited in all laboratory areas. All laboratory work performed by users must be recorded in laboratory worksheets/progress reports. Procedural manuals and protocols are available at all times in the laboratory. All technical procedures should be performed in a way that minimizes the formation of aerosols and droplets. Perform procedures that liberate infectious bioaerosols in the biological safety cabinet. Mouth pipetting is strictly forbidden; mechanical pipetting devices or bulbs must be used only. Before working with hazardous chemicals, the potential risks must be established and necessary safety measures taken. The relevant precautions and handling information set out in the safety data sheets (SDS) must be strictly observed. Conduct procedures involving the release of volatile toxic or flammable materials in the chemical fume hood. The additional safety measures required in the particular case must be observed. All commercial chemical reagents and solutions must be properly labelled prior to use e.g. name, date of opening, expiration date and storage conditions. All culture, media, solutions and reagents prepared in the laboratory should be clearly labelled with reagent name, preparation date and name of researcher. If they are hazardous, label them with proper warning and hazard information. Follow all storage and labelling procedures established in the laboratory accordingly. Student requests for chemicals, specimens or borrowing glassware must be made by filling out the necessary forms. Student researchers are responsible for all their borrowed materials and any breakage or loss incurred by them. All chemical storage areas are off-limits to student researchers. All glassware must be washed after use and returned to appropriate location. All sterilized glassware must be covered with aluminum foil and labelled with date of sterilization and will not be stored more than 3 weeks before use. 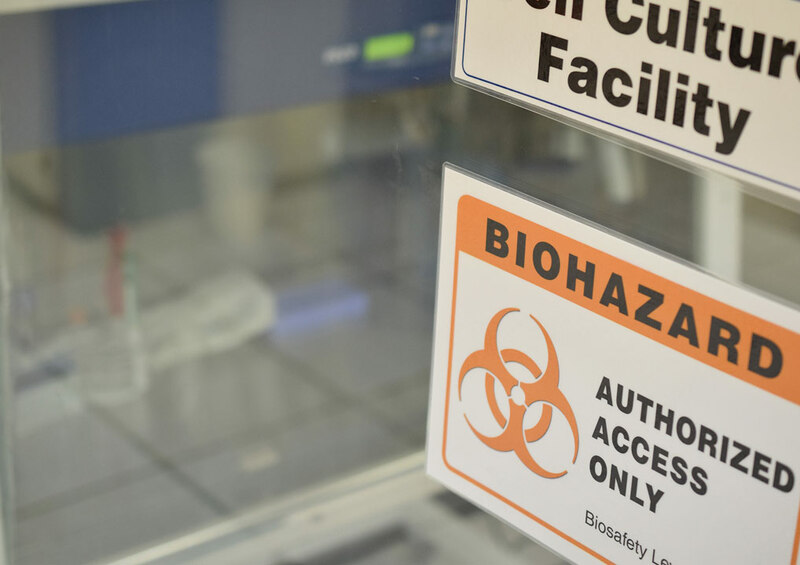 All spills, accidents, broken glassware and evident or potential exposures to infectious materials must be reported to the laboratory staff at once. The written procedure for the clean-up of all spills must be followed. It is the user’s responsibility to use the laboratory resources in a responsible manner. Users should contact the Laboratory Director or facility staff if technical assistance is needed. Do not hesitate to consult the laboratory staff whenever needed or in doubt of safe working practices. Failure to comply with MCB Laboratory policies and procedures may delay the start of the experiment or result in suspension of use or services. The laboratory working areas and benches should be kept clean, disinfected and free of materials not relevant to work. All laboratory equipment must remain in their designated areas. Stocks are stored only in the designated areas or cupboards. Label all containers, bottles, glassware and assigned drawers clearly. Never return unused chemicals to the reagent bottles. Always disinfect work benches before and after laboratory work. Work surfaces must be decontaminated after any spill of potentially hazardous materials. Follow at all times aseptic techniques to prevent involuntary contamination of samples, test media and other individuals of the laboratory. Wash hands thoroughly before leaving the laboratory. Safety rules and regulations regarding use of instruments must be strictly followed by all student researchers in the laboratory. Use of some laboratory equipment must be in the presence of the Laboratory staff or Research Supervisor. Users must immediately report any malfunctioning equipment to the MCB Laboratory Director. Damage from misuse will result in charges for repair costs. Dispose of all biological waste properly into appropriate containers (Orange Biohazard bags). Live cultures can be treated with 10% bleach solution or autoclaved. Do not toss out into regular trash or down drains without treating! Dispose of chemicals in the labelled waste containers, not down the sink! Wear protective gloves if needed. Always consult laboratory staff if unsure on how to dispose materials or broken glassware. 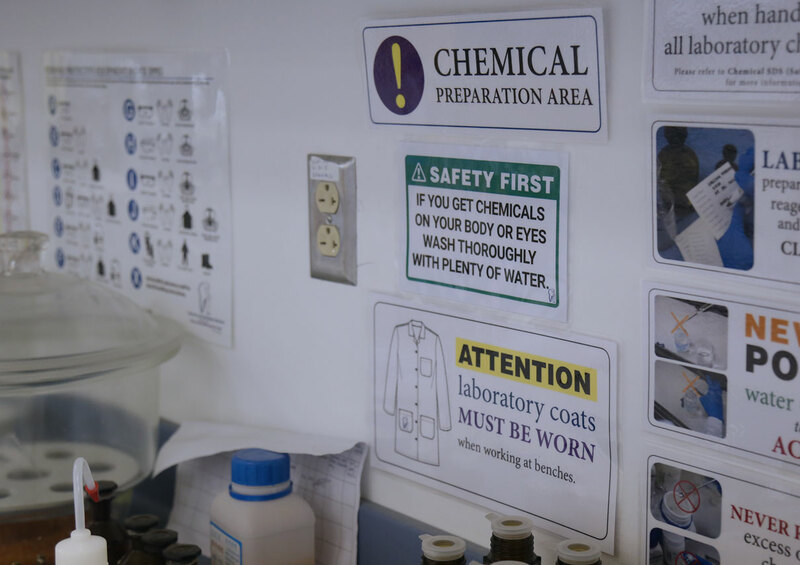 Know the locations of safety features of the laboratory including the safety shower, nearest sink, chemical spill cleanup kit and fire extinguisher. The purpose of Molecular and Cell Biology Laboratory Biosafety Guidline is to establish a written program that provides for and supports the procedures, equipment, personal protective equipment, and work practices for protecting laboratory personnel from potential biological health hazards in the laboratory. Policies for the safe handling of sharps, such as needles, scalpels, pipettes, and broken glassware must be developed and implemented. a. Used disposable needles and syringes must be carefully placed in conveniently located puncture-resistant containers used for sharps disposal. b. Non-disposable sharps must be placed in a hard-walled container for transport to a processing area for decontamination, preferably by autoclaving. c. Broken glassware must not be handled directly. Instead, it must be removed using a brush and dustpan, tongs, or forceps. Plastic ware should be substituted for glassware whenever possible.